This Christmas we went to New Zealand to see the grandparents. Scarred from the last time with Harvey and my weird fear of flying, I was worried. But this time round it was actually OK. Even the turbulence wasn't that bad. Harvey is 3 now (I guess he isn't a toddler. What do you call him? A little person? Threenager?) and he was easily occupied by the onboard movies (even without headphones! Weird child). Seb (18 months) was the difficult one to deal with, but only in sleep. And even though only one of the four flights was a night flight, the boys still slept. I don't think we made too much noise, with Seb crying in his sleep, the boys fighting and me shouting at them. At one point, almost strangled them! 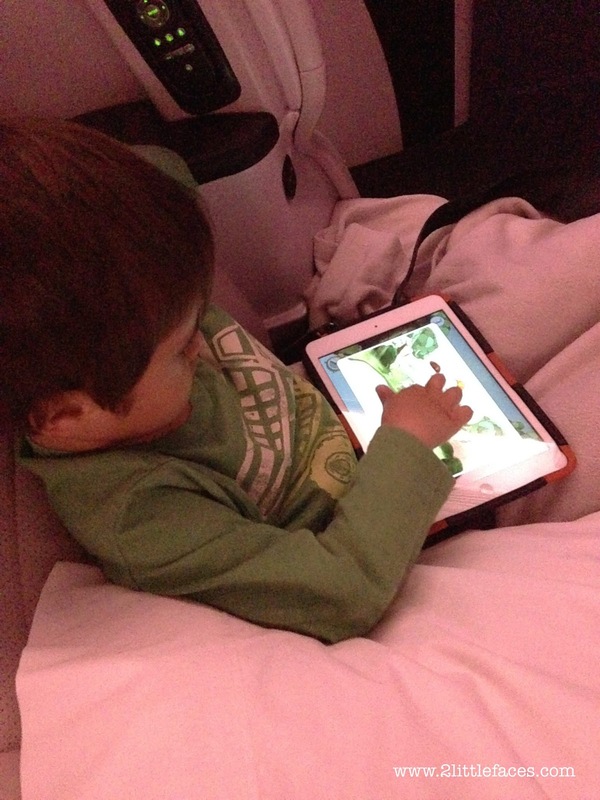 In prep for this trip, I read all the posts I could find on flying with 2 toddlers how to keep them occupied. Some tips were useful and some really didn't apply. 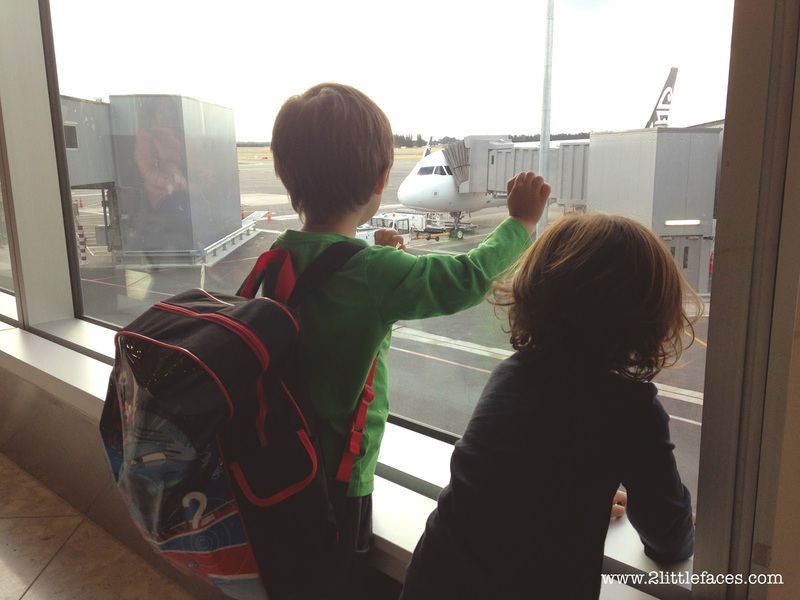 Here are my tips for travelling long haul with 2 toddlers or monsters under 4. 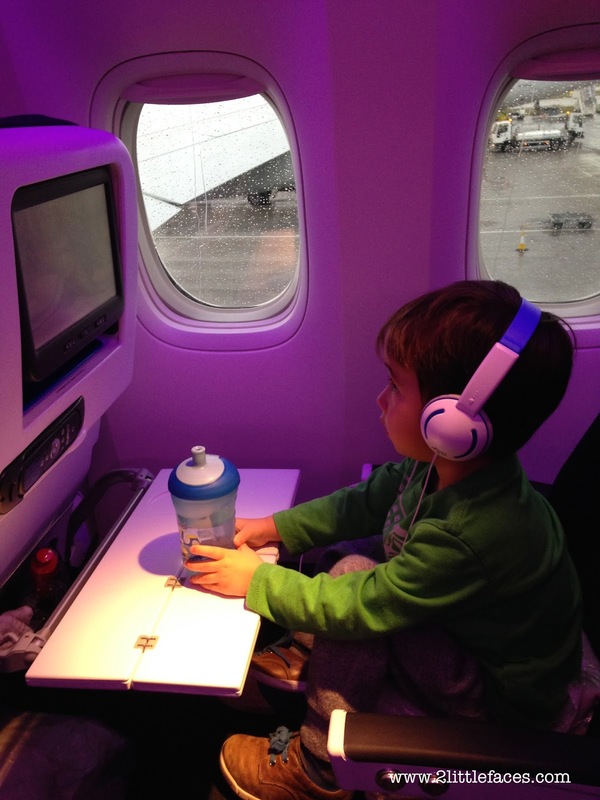 Get night flights if you can which is closer to your toddlers bedtime. And if not find out where the kids play area is at the airport and run them ragged before the flight so they, hopefully, will zonk out on the plane. 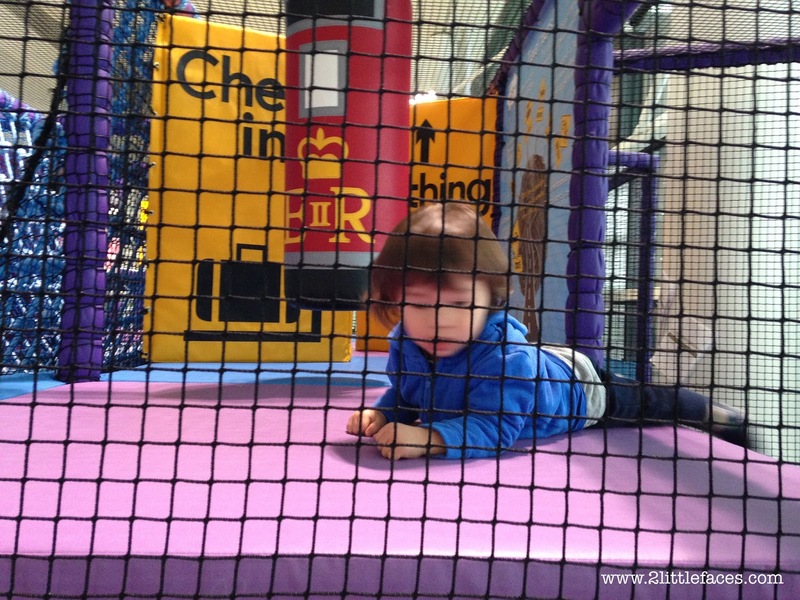 Find out where the airport play areas are. First flight was at 3pm UK to LA. Boys fell asleep not long after take off. That was easy. But I made the mistake of not sleeping as well so when the boys woke there was no chance of me sleeping. And a grumpy mummy I did make! with no sleep for over 24 hours it was bad! The flight to NZ from UK is about 24 hours plus. And I did not fancy doing that flight! Flying via LA, we stayed with friends for a few days. So 12 hours or so each flight made it easier. Bring the sippy cups and bottles. They will get dehydrated during the flight. Great for take off and landing. Harvey had a child's meal, but Seb didn't so he had lots of fruit and biscuits. I didn't take too many sweet things. Last time I went with Harvey I forgot to order a child's meal. And I didn't have any snacks so he had a banana and crusty roll I saved from my dinner. This time I made sure Harvey had a meal. He did pretty well on it. Plus the kids meal seemed nicer than the adult meals! So if they don't eat it you can! Sky couch, great for eating and sleeping! That thing was a saviour! I didn't mind having Peppa pig play over and over again. Seb was mesmerised by it. 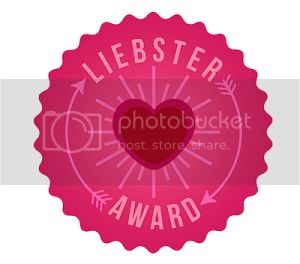 But I did get hit in the face a few times with it by Seb telling me he had accidentally turned off the app. Harvey watched the movies on the plane. My boys are strange and didn't use headphones but if your toddler does need the sound train them up a few days before the flight with using headphones and the iPad. Don't bring out favourite toys/loved toys on the plane. We lost Puppy somewhere and Harvey was very upset. Luckily I "found" puppy in an airport shop! 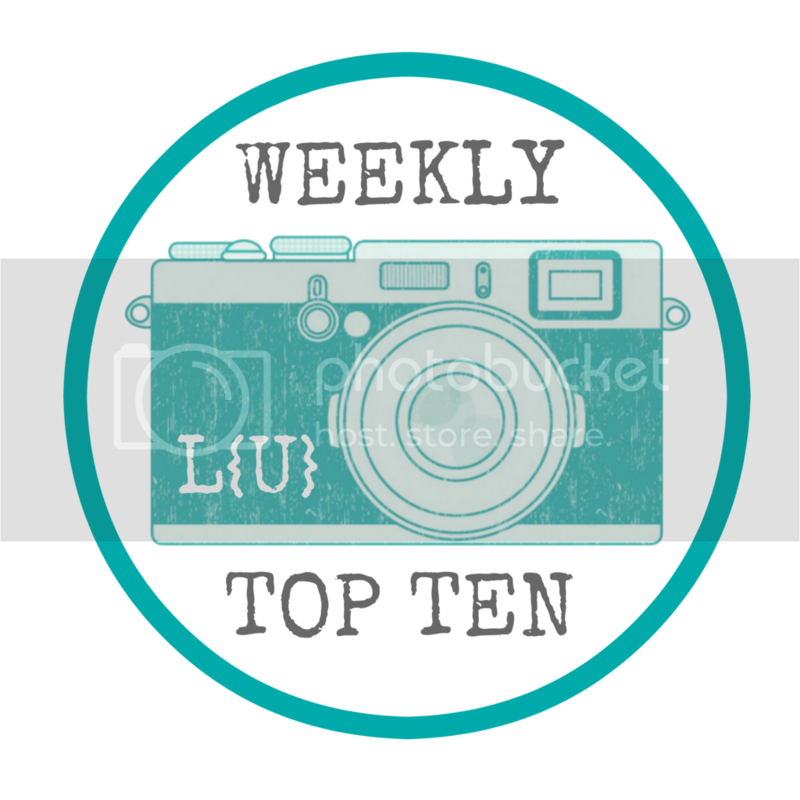 Best not to bring too much stuff onto the plane, there isn't much space so you are bound to lose things down the side of seats and when leaving it is a bit of a mad rush to look for everything while everyone is getting their bags down. Out of the list, for all the flights, we only really used the magazine, crayons, a few cars, iPad and a storybook. Make sure your kids are dressed comfortably. Imagine wearing jeans and nappies and stuck sitting or sleeping in them for hours. For both you and the kids. Didn't need them but always a good one. 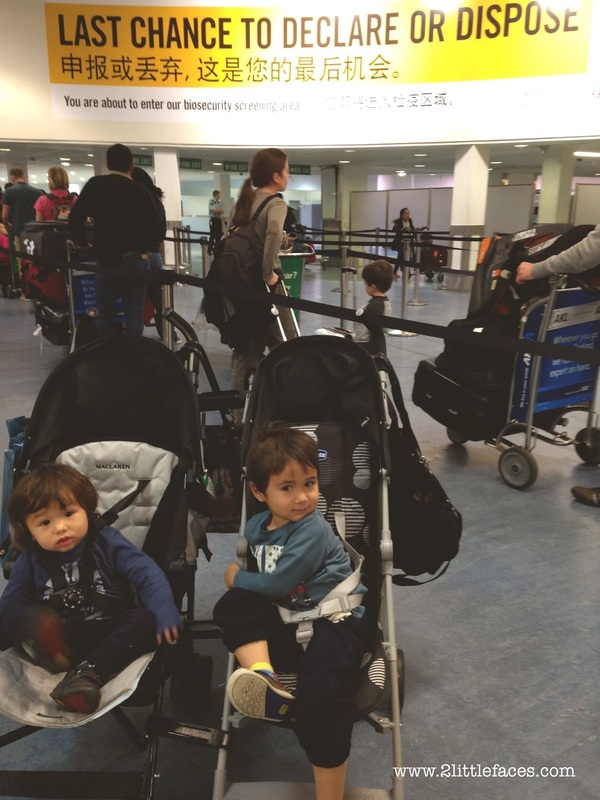 Most times they will let you take the stroller to the plane or at boarding. And you will get them as you leave the plane. Or they will put it in oversized luggage. Just check where your stroller goes. Also, generally you are allowed to take a stroller and car seat, for each child, for free. There are services at the airport that can help you with luggage or transit. Especially useful if you are on your own with 2 kids, strollers and god knows how many suitcases! We had a lot it seems (3 suitcases, 4 carry-ons and a stroller bag with 2 strollers in it) and the man at Passport Control asked us why we had so much luggage. My reply was "Um because we have kids?". If you are a very good parent you would, of course, try to keep the bedtime routine. Brush teeth, pj's, story and then bed. I found I didn't have the time or energy or space! 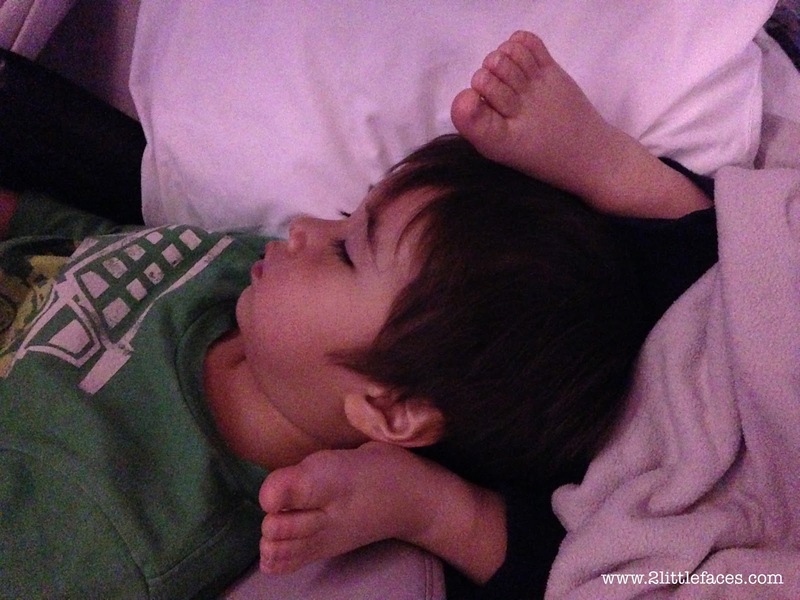 The boys slept fine without routine and this way it meant less stuff to bring on board! I would recommend this option for anyone flying Air New Zealand! We flew both economy sky couch and premium economy and as much as I loved the service in premium economy, the sky couch was the winner for comfort. I could lie the boys down side by side on the two seats so I didn't have to hold Seb the whole trip. In premium, the love seats were a bit awkward to try to lie down on. Great if you are flying on your own, of course. If you, for some reason, choose to fly another airline. Try to get a row of seats to yourself if you can...holding Seb to sleep was hard as he was a wriggler. I have so many injuries from this trip! Or ask about sitting bulkhead and ask for a bassinet if your baby still fits in one. Each airline will have different weight capacities. And please PLEASE don't let your baby sit and play in the bassinet unattended! A certain mother did and Harvey fell head over heels out of it! IN FRONT OF A PLANE FULL OF PEOPLE! (No babies were harmed. I caught him in time). Make friends on the plane! Although I was on the same flight with Steve, he was sitting in the next aisle, so the Steward thought I was flying alone and offered to look after the boys if I needed any help. Plus giving a smile or two to the people around you never goes a-miss.